The Red Bull Stratos project, was the only non-government initiative that allowed a human being to perform with success an ascent to 120.000 feet in a stratospheric balloon and made a freefall jump, in the last 50 years. With the support of the Austrian company Red Bull GMBH as main sponsor, the extreme parachutist Felix Baumgartner as pilot -also from Austria- and a team composed by experts in aerospace medicine, engineering, pressure suit development, capsule creation and balloon operations, the project pursued to break four world records as well to obtain valuable data that may result of scientific interest for the development of extreme altitude bail-out techniques. Retired USAF Colonel Joseph Kittinger, whom previously held the record jump from 102,800 ft in 1960 acted as mentor of the project and as Mission Control's primary point of radio contact with the pilot during flight. The team was completed with Art Thompson (technical project director), Mike Todd (life support engineer), Jonathan Clark (medical director), Andy Walshe (high performance director), Marle Hewett (program manager & senior flight test engineer), Don Day Jr. (meteorologist) and more than 100 experts in several areas. 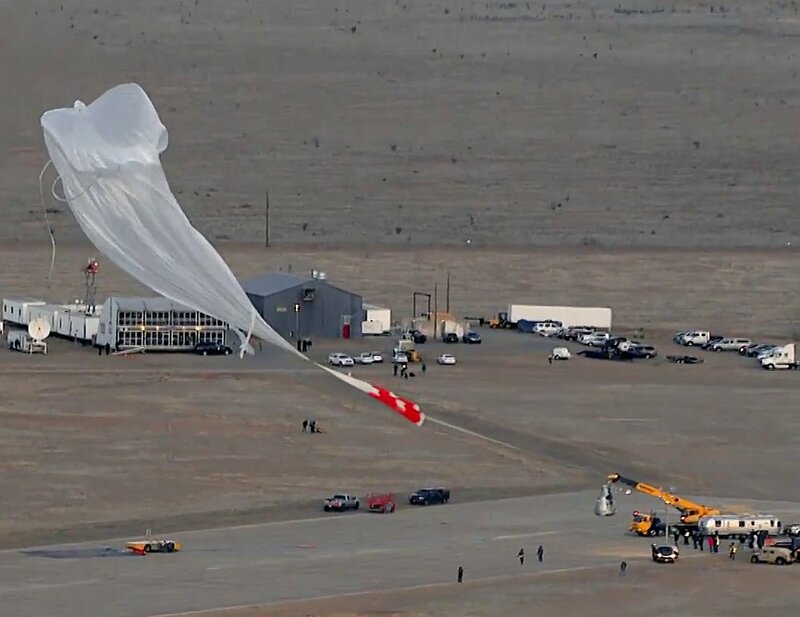 The main element of hardware of the project was a pressurized capsule designed and built by Sage Cheshire, an aerospace firm from California, and was composed of four main elements. The inner structure is the pressure sphere which was molded from fiberglass and epoxy painted with fireproof paint, with a rolling door and windows made of acrylic. It have a diameter of 6 feet, and concontains displays, instrument panels, cameras and the sitting space of the pilot. 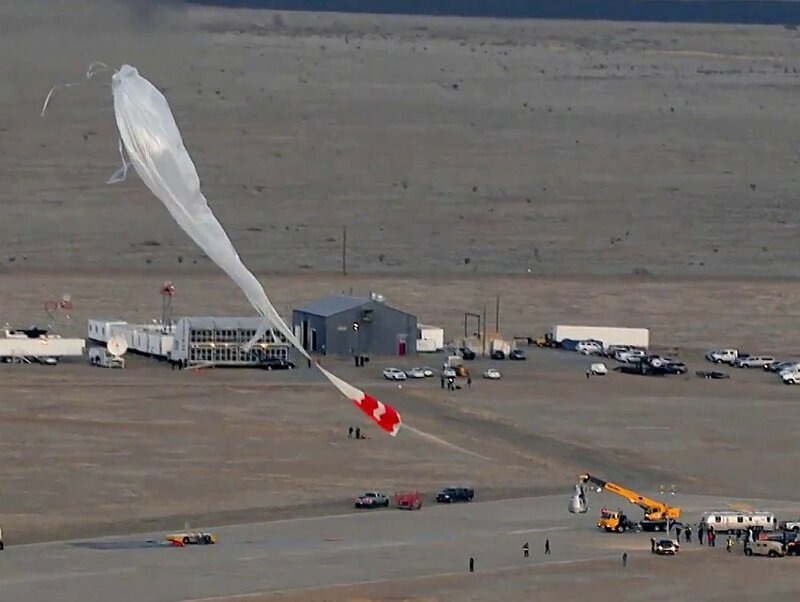 During the flight it was pressurized to 8 psi, the equivalent to 16,000 feet above sea level, to reduce significantly the risk of decompression sickness without requiring the pilot to inflate his pressure suit. Sourrounding the pressure sphere is the so called "cage" which cover and supports the capsule overall. It is made from welded tubes of chromium-molybdenum (a strong steel alloy used in aerospace industries) being the point where the capsule attaches to the balloon bearing the load for the parachute system. Sourrounding both elements is the shell, the part of the capsule that is visible to the observer. It measures 11 feet high, and is made of foam-insulated skin covered in fiberglass and paint. It provides protection and insulation from the lower stratosphere temperatures. Finally the 8-foot-diameter capsule base is the broadest part of the vessel, providing protection in the form of the base panel and crush pads. 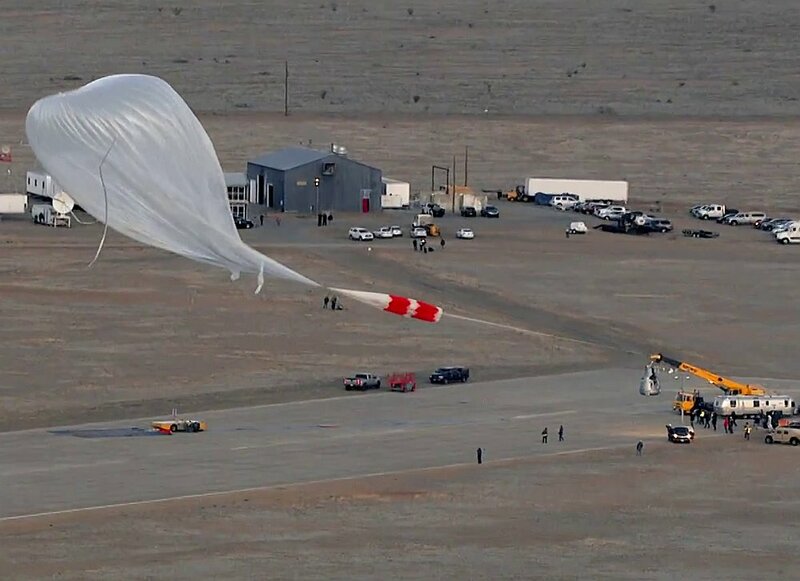 It comprises a 2-inch-thick aluminum honeycomb sandwich panel which protects the capsule from sharp objects during landing and also provides a mounting area for the balloon system control box and batteries. Outside the base are the crush pads, composed of cell-paper honeycomb covered by a fiberglass/epoxy fairing, similar to those often used on unmanned balloon-borne payloads. They were designed to handle 8 Gs on impact, thus providing shock absorption for the capsule's parachute landing. The chair in which the pilot sits, has a sliding mechanism that allows it to move forward to get the lower half of his body out from the pressure sphere at the time of the jump. At the sides of the door there are two handrails that allows him to stand on the edge of the capsule, while maintaining stability. Finally, a great number of High Definition (HD) cameras, remotely controlled from the Mission Control Center, are part of the capsule's hardware. Four of them are attached to the exterior base, eight are in the pressurized housings on the exterior, and three are on the interior. All HD cameras store the images to solid-state digital recorders on board, and are also routed to one of the three digital video transmitters for live viewing on Earth. Fully loaded, the overall structure weights around 1315 kg. 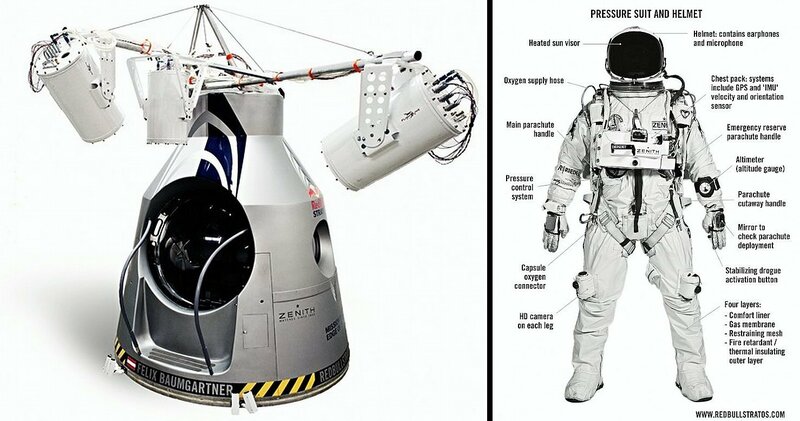 The personal life support system of the pilot is composed by a full-pressure suit, gloves and helmet designed by the David Clark Company. Its purpose is to isolate the pilot from the extreme stratospheric temperatures, to avert symptoms of decompression sickness and to maintain pressure around his body. Althought it was modeled on suits worn by pilots of high-altitude reconnaissance aircraft, it has been custom made to the pilot's measurements and modified with new enhancements. The key factor was mobility as the pilot needs to have more freedom of movements for a better control of the body attitude during the fall. Thus was designed a special rotating locking neck ring that attaches the suit to the helmet as well gloves attachments. Several small mirrors were located strategically on the suit, to overcome the limitations on peripheral vision impossed to the pilot by the helmet. The helmet shell is molded from composite materials, contrinuting to its light weight but at the same time maintaining it strong and resistant to impact. An integrated microphone and earphones allows the contact with Mission Control. The visor is distortion free and counts with an integrated heating circuit to prevent fogging and icing. 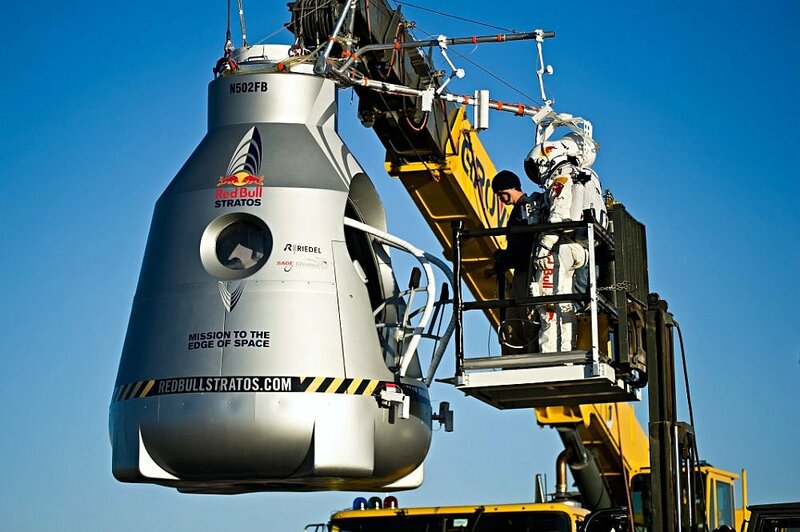 A regulator in the helmet provides oxygen to the pilot from three possible sources: a liquefied oxygen source on the ground; the capsule's system, and a pair of high-pressure gaseous oxygen cylinders used during the freefall descent, with an autonomy of 10 minutes. The core of the control and communications systems are located in the so called chest pack, which is mounted over the pressurized suit. It includes the voice transmitter and receiver that connect to the helmet, GPS beacons, telemetry equipment, an HD camera with a 120º view (along with other two cameras located on each thigh), an inertia measurement unit to report altitude and spin and finally a package provided by the Fédération Aéronautique Internationale to verify the records established. The main parachute is a nine-cell, ram-air, 270-square-foot/25-square-meter canopy and is opened by pulling a handle. It is located in a back pack that also houses the drogue stabilization chute and the reserve parachute. A harness attaches the entire rig to the pilot and also holds the two bail-out oxygen bottles. The highest danger for the pilot during the fall is to enter in a uncontrolable flat spin. 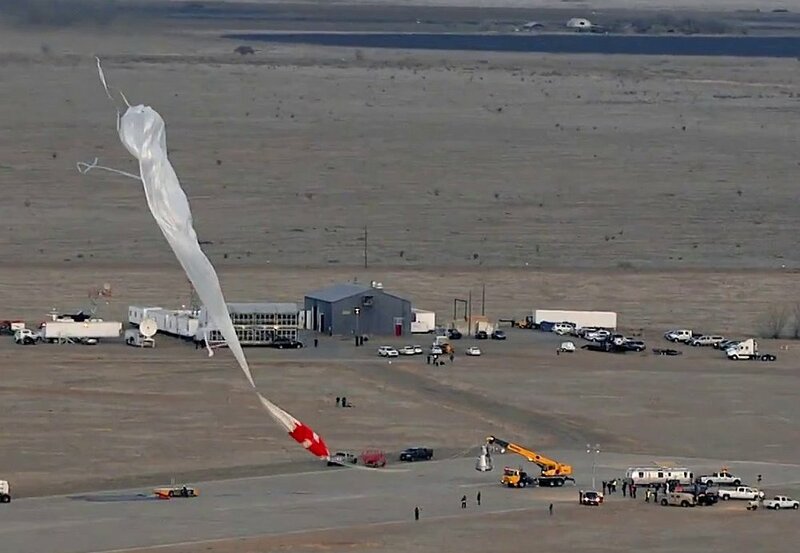 To overcome this was built a special sensor which will open the drogue stabilization chute automatically, if the pilot experiences 3.5 Gs or more for a continuous period of 6 seconds. The combined parachute system components, weights 27 kg. The objective of this first mission was to fly over the "Armstrong Line" and to do tests under real conditions for the first time. That imaginary line is the area in aerospace where earthly boundaries and laws disappear. It's an inhospitable region for humans where liquids begin to vaporize and temperatures plunge to minus 75 degrees Fahrenheit. Humans could not survive in this zone without a pressurized suit. However, this first attempt resulted in failure when the balloon collapsed seconds before picking up the capsule from the launch crane. The mission was acomplished succesfully on March 15th, 2012.